October | 2014 | Planet Pedro! THE proposal of Nicola Sturgeon for a Scottish (or English, or Welsh, or Northern Irish) veto in an in-out EU referendum is to be very much welcomed. It is very much in line with the position of many other countries where constitutional change must be subject to a high level of approval by the population. Examples of this principle include the United States, which requires a two-thirds majority for amendments to the Constitution, and Canada, where a “double majority” of voters and provinces applies. To adopt a similar requirement for constitutional measures in the UK would be an excellent measure. Let us hope that the Smith Commission adopts this proposal from Ms Sturgeon, as it would ensure that any independence proposal for Scotland would require a referendum of the whole UK, and allow a veto to voters in Wales, Northern Ireland and England. There is much talk in the Scottish media about a crisis in Scottish Labour. Some of it is of course froth (is the Scottish Daily Mail where we would seek advice in our best interest?) But some of it is substantial, being based on the post-poll evidence that anything between 30-40% of Labour voters voted Yes in the referendum. In other words, having failed to break the UK, the Yessers would gleefully, as a close second best, like to break Scottish Labour. It is against this background that we look to the next three years and their respective elections: Westminster 2015, Holyrood 2016, and local councils 2017. Taken together, these elections are now an existential challenge for the party in Scotland: if we fail, we put at risk our potential to be a force in Scottish politics again in the foreseeable future, and perhaps ever. So what should Scottish Labour do? Here are some basic ideas to get working on. First, let’s give some leadership: Scottish Labour has to take the political process by the lapels and show it who’s boss – as in who won the referendum, and who is going to dictate to whom in the coming weeks and months. Alex Salmond spoke about “holding the feet of the UK parties to the fire” over extra Holyrood powers, and Nicola Sturgeon looks like she will follow suit. Tough – they lost the referendum by a clear majority and it is their feet that should be held to the fire until they admit that fact. This is not just in Scottish Labour’s interest, but it is our duty to the 55% of Scottish voters who voted No to dominate the argument. Like the old Scottish football manager Jimmy Sirrel said “the best team always wins and the rest is only gossip.” Scottish Labour needs to be clear that we are on the side of the majority and of democracy. We need to keep the SNP painted into its losing corner with the minority, aligned with the 45ers and the UDIers in the anti-democracy fringe. Secondly, Scottish Labour must upscale the appeal of our unique selling point: that we are a party of UK government. Most immediately, we must make it clear that as part of the winning side in the referendum, we can and will act to safeguard the outcome. It should therefore be announced as soon as possible as a headline commitment in next May’s General Election manifesto that no Labour government will agree to a new Scottish independence referendum: not in the next Parliament, not ever. Thirdly, we must use our status as a UK party which can and will influence the big agendas of the coming years. The defeat of independence means that the essential issues of the economy and welfare, as well as defence and foreign affairs, remain at Westminster, meaning that Labour has a role in these areas which the SNP cannot rival. Our message must be that if Scots want a voice in shaping the next decades, they are will be fools to waste their vote on the SNP. And if they want those decades to be socially progressive and economically successful, they will be wise to vote Labour. Finally, we must look at how these cases, all based on the votes of the majority and common sense, can be presented effectively. Every night on television we see the SNP and the defeated Yessers acting as if their campaign was still alive or as if they won the referendum. Labour’s campaign and public relations resources must be used to make sure that they do not go unchallenged. The SNP claim that No voters will be angry if new powers are not delivered to Holyrood: in fact, many No voters are already enraged by the way that their votes are being ignored by the SNP and by media commentators obsessed with the Yes vote. The message is easy enough: Yes lost, and anyone continuing to argue the independence case should have their credibility shredded at every possible opportunity. The referendum campaign showed that we have the people to do the job. Let’s use them. We can and must show up Yes for what it is: a zombie movement, running around causing havoc after life expired from its cause in the early morning of 19th September. These steps do not address some of the issues which we face heading into the subsequent Holyrood Elections, although presenting ourselves as ‘Scotland’s UK party of social democracy’ in opposition to the SNP as ‘Scotland’s Party of Scotland’ has to be an advantage. It could even be a foundation for what we could call ‘Scotland’s Social Contract’ – a narrative which puts together our achievements, our polices and our objectives as we go forward into 2016. Above all, however, they are steps which are bold enough to grab the initiative and set the agenda for the 2015 General Election in post-referendum Scotland. Moreover, they offer what people want and what Scotland needs. Posted on 10/22/2014 by planetpedro CommentsNo Comments on Historic personal first. This is a reponse to a letter of 20th October, second here: http://www.heraldscotland.com/comment/letters/sturgeon-has-earned-chance-to-take-the-country-forward.25627368. The Herald cut my original first sentence; my original is in italics. DAVID C Purdie is correct in describing me as neither an SNP voter nor sympathiser (Letters, October 20). I am indeed one of the clear majority of Scottish voters who unambiguously voted No to Scottish independence, and I believe that is our democratic right to have our vote recognised by the incoming First Minister. It does not seem unreasonable to expect Nicola Sturgeon, coming into office in full knowledge of the will of the Scottish people, to pledge to work in their interest, which has now been defined in the clearest possible terms: Scotland will continue as part of the UK. Indeed, it is difficult to see why she would wish to become First Minister if she did not intend to do so. Like I said, over to you, Nicola. Posted on 10/18/2014 by planetpedro CommentsNo Comments on What I Told Lord Smith…..
What I Told Lord Smith….. In his memoir “Power Trip” (to be recommended) Damien McBride recounts how in public consultations, more notice is sometimes taken of individual submissions than of predictable corporate and vested interests. So I decided that it was worth writing to Lord Smith. Here is my submission, which to a considerable extent reflects the need to protect the union if devolution is to be maximised. No doubt you have many submissions from the public regarding extra powers for the Scottish Parliament, in addition to those of the three political parties and that of the Scottish Government. I would like to make the following points, of which I hope you will take notice in your deliberations. It is essential that your Commission makes no recommendation which weakens the United Kingdom. The people of Scotland decided conclusively that Scotland should not be an independent country: this is the one single and indisputable fact that matters in the referendum outcome. You may recall the old Scottish football manager Jimmy Sirrel, who coined the aphorism “the best team always wins and the rest is only gossip.” In this case, the extra powers are part of the gossip, as clearly as a good but losing performance on the football pitch does not win. Therefore, any submission or proposal based on “not how far we fell short, but on how far we have come [towards independence]” as Alex Salmond put it, must be dismissed. It therefore follows that this principle should be reflected in the legislative outcome of the Commission’s work. Most immediately, this means that if the permanent status of the Scottish Parliament is enshrined in UK law, the overall authority of Scotland’s UK Parliament must also be codified and enshrined in that law, together with the relationship between the two institutions. The Scottish Parliament is a permanent democratic institution of the UK (i.e., not of Scotland) as are the Assemblies in Cardiff and Belfast. The outcome of the Independence Referendum is binding and permanent. 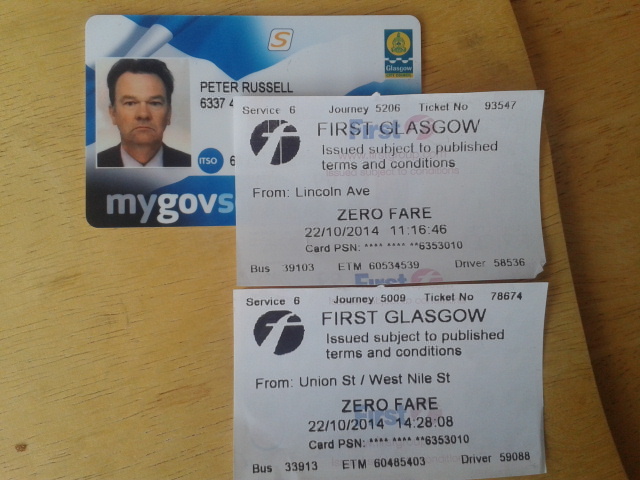 This is of course the logical conclusion of the Edinburgh Agreement. However, it is clear that this principle is in danger of being breached by the outgoing and incoming First Ministers, neither of whom have ruled out a further referendum, or recommended a moratorium. The Edinburgh Agreement demanded that the referendum should be “legal and fair producing a decisive and respected outcome.” These requirements have been met beyond all reasonable doubt. However, if the Scottish electorate are to have confidence in the referendum and its aims as set out in the Agreement (and in turn the democratic process as a whole), it is also clear that its outcome should be seen to be permanent. There are a number of ways that this can be achieved. There is a need for the Scottish Parliament to be subject to a scrutiny process. It was one of the original theories of the Scottish Parliament that the combination of a proportional electoral system and an effective committee structure would guard against the dominance of any party or partisan interest. Since the election of 2011 this has been proven not be the case. It is therefore now clear that any extra powers should be conditional on extra scrutiny of the Holyrood legislative process. This scrutiny could be achieved within current resources by using Scotland’s Westminster MPs (excluding those in government) as a scrutiny body, with well-defined powers of delay and revision of legislation. The Scottish Parliament could sit for three days per week and the MPs use the Chamber for the other two weekdays for this purpose. The process of devolution should not be confined to Holyrood. It is now anticipated that the Scottish Independence Referendum will act as a catalyst for some devolution within England, which may be based on city-regions. If this is the case, Manchester, Birmingham, etc. will have a range of additional self-government powers and responsibilities. These could include powers over personal and business taxation as well as responsibilities for health, economic development, housing and structure planning. If in Scotland these powers are retained at Holyrood, Scottish cities will be at a considerable disadvantage to the English regional cities and city-regions. The Commission should therefore also consider recommending that devolution should be extended to Scottish city regions, especially Greater Glasgow and Edinburgh/Lothians. This further distribution of constitutional power to city-regions could also have the effect of making a spurious or opportunist call for a further referendum less likely to be successful. Finally, I would conclude that more devolution can only come about in the context of a strong centre . Conversely, if the centre is not strengthened appropriately, the work of the Commission will be restricted in its scope. This would of course not be an unacceptable outcome to the vast majority who voted No on 18th September, as –to reiterate – the only result which is absolute is No to independence. However, many of us who wish to see greater decentralisation of power within both the UK and Scotland would regard an outcome which did not achieve that aim as a lost opportunity. I hope that this submission has been of interest and assistance to you. Posted on 10/18/2014 by planetpedro CommentsNo Comments on Yes Vote – Nationalism or Despair? – Courtesy of David Webster. Yes Vote – Nationalism or Despair? – Courtesy of David Webster. At the meeting of Glasgow Fabians on 11th October, our friend David Webster produced the following graph. (Click on image to enlarge) I have also included his excellent commentary. THE YES VOTE – NATIONALISM OR DESPAIR? 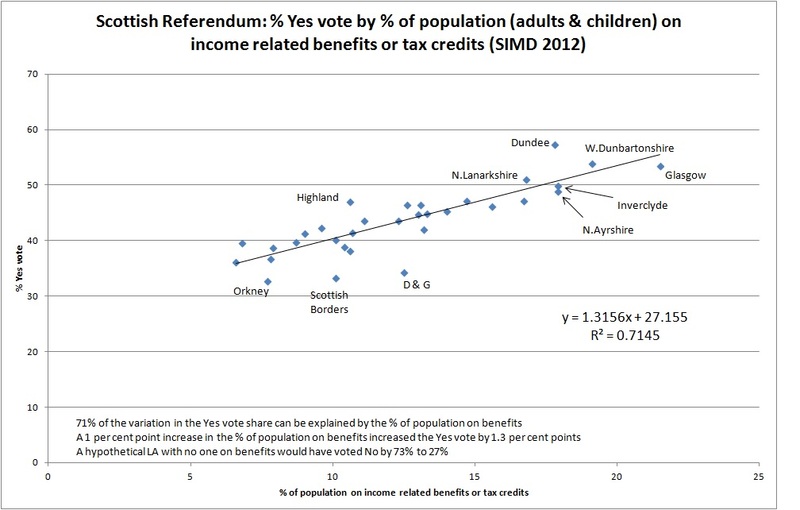 The attached chart shows that most (71%) of the variation in the Yes vote share in the Referendum across Scottish local authorities can be explained by the percentage of the population living on means tested benefits or tax credits, as defined in the Scottish Index of Multiple Deprivation. This is a very strong effect by any standards and suggests that other explanations – such as pre-existing commitment to nationalism as shown by the previous SNP vote, or religious affiliation – have little power. The chart suggests that actual preference for independence is no greater than it was known to be already – i.e. at most one third of the electorate. This is indicated by the evidence in the chart that a hypothetical local authority with no one on benefits would have voted No by 73% to 27%. The chart also shows that the significance of the Yes vote in Glasgow has been overstated. The city was absolutely in line with the national trend, once deprivation is taken into account. Dundee and Highlands, by contrast, had clearly bigger Yes votes than the national trend would suggest, while Orkney, Scottish Borders and Dumfries & Galloway had lower Yes votes. A 1 percentage point increase in the percentage of population on benefits increased the Yes vote by 1.3 percentage points. This shows that the ‘benefits’ effect cannot have been due simply to voting by people currently on benefits. Also, Lord Ashcroft’s poll at http://lordashcroftpolls.com/2014/09/scotland-voted/ has only 10% of voters saying that benefits were among the two or three most important influences on their vote. So the ‘benefits’ effect is probably both representing people on benefits and proxying for something else. What is the something else? The Catholic archbishop of Glasgow has argued (Herald, 23/9/2014) that ‘despair and deprivation’ were key factors in the vote, because too many people ‘feel threatened and disheartened by poor life chances’. He seems to be right. Certainly, the Yes campaign appeared to gain enormous traction through constant references to issues such as the bedroom tax and the growth of Food Banks, while Labour Party dissidents like Bob Holman specifically campaigned to win over disadvantaged people to Yes. The claim that independence would help the disadvantaged is based on hope, not evidence. Bob Holman likes to attack the Westminster parliament for its social privilege – but Scottish MSPs are four times more likely to have gone to private schools than their constituents (Herald, 7/4/2014), and there are more ex-manual workers in the House of Lords than there are in the Scottish Parliament. The SNP largely represents constituencies which were previously Tory. And the SNP’s record in government is hardly encouraging – a 25% cut in further education funding while universities stay free, a council tax freeze which cuts services on which poor people rely but disproportionately benefits the better-off, an almost total lack of progressive labour market policies. Not to mention, of course, that a post-independence Scotland would be beset by funding problems, due to factors such as the costs of setting up a new state, the need to build up currency reserves, the loss of tax revenue from companies moving south, higher borrowing costs, unfavourable EU entry terms, and loss of population due to discriminatory policies against migrants from the rest of the UK. The Irish Free State in the 1920s and 1930s offers a salutary warning – it cut old age pensions and school meals to pay for lucrative new state jobs, lost more population after independence than before, and by repudiating its debt (the ‘land annuities’), provoked a trade war with the UK which caused lasting damage to the Irish economy. Nevertheless there is a lot of work for the Labour movement to do. The lesson that it was neoliberal policies, mainly of the Tories since Thatcher, which nearly lost the Union, while it was the Labour movement that saved it, needs to be hammered home. It has to challenge the Yes campaigners now to shift their energies to delivering the policies and programmes to tackle disadvantage which lie within the soon-to-be expanded powers of the Scottish Parliament. And it has to show that neoliberalism can be defeated across the UK. YOU report that Nicola Sturgeon is to go on progress through Scotland ahead of her coronation as leader of the SNP and in turn First Minister (“Sturgeon in unprecedented tour before Cabinet reshuffle”, The Herald, October 16). This should be welcomed as an excellent oppor­tunity for her to elaborate on her social democratic credentials. On the “social” side, she may wish to apologise to her followers for the SNP’s failure to take action on poverty and inequality in Scotland in her party’s seven years in office, and set out how she intends to address these issues. The old game of blaming Westminster is no longer viable now that Scots have confirmed their view that such matters as employment and welfare should be addressed on the level of the whole UK. Indeed, Ms Sturgeon will only show real leadership of both her party and of the country if she has the courage to embrace the democratic will of the Scottish people. She must tell them that in the referendum the voters rejected independence, that it is a lost cause, and there will not be a further referendum in the foreseeable future. Anything else would not only be denial of the “democratic” part of “social democrat” but a betrayal of the right of self-determination of the Scottish people, as exercised on September 18. Over to you, Nicola.